Check Out the 2013 Oscar Nominees for Best Animated Feature & Short! 1. BRAVE (Pixar Animation Studios): Released in June, this fantasy story of a mother-daughter relationship managed to get some Oscar love. Can it win? Will Pixar’s winning streak be re-established? 2. FRANKENWEENIE (Tim Burton Animation Co.): This Halloween flick got rave reviews, but didn’t set the box office on fire. Could this be a surprise winner? 3. PARANORMAN (LAIKA): ParaNorman was easily the most popular stop-motion film of 2012, and was a hit with the masses. Its nomination was an expected one. If ParaNorman wins, it will only be the second stop-motion film to win the Oscar for Best Animated Feature. 4. THE PIRATES! BAND OF MISFITS (Aardman Animation): Another stop-motion film, this was also one of the best reviewed films of 2012. Surprisingly, it’s the only non-American film on this list. Can it beat the rest? 5. WRECK-IT RALPH (Walt Disney Animation Studios): Could Wreck-It Ralph be the first ever Disney animated film to win the Best Animated Feature Oscar? It certainly is the frontrunner, being a box office hit and a critical success as well. It’s a bit surprising to see that DreamWorks was snubbed completely. Neither Madagascar 3 nor the well-reviewed Rise of the Guardians got a nomination. Unlike last year when both DreamWorks films Puss in Boots and Kung Fu Panda 2 recieved nods. Neither did Studio Ghibli’s The Secret World of Arriety get any recognition. 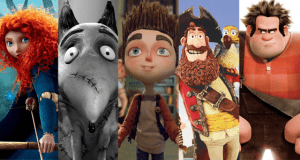 Which animated film and short has YOUR vote? Let us know!